Essential Tools for Treating the Patient in Pain™ is designed for clinicians and all healthcare practitioners interested in obtaining an overview of the fundamentals of pain medicine in addition to identifying best practices and practical approaches to the treatment of common pain disorders. 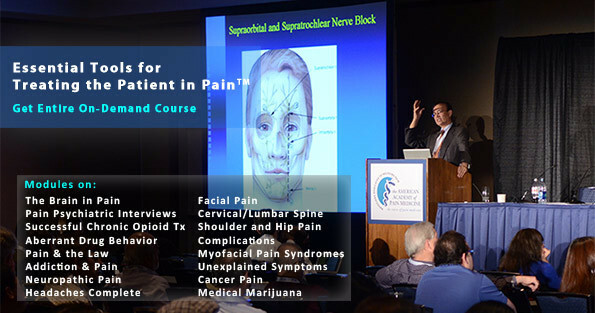 These on-demand education modules address the unmet education needs of all clinicians treating people with pain, through clinically-focused, case-based lectures that are designed to advance patient outcomes by improving the assessment, diagnosis, treatment, and management of patients with various acute and chronic pain disorders, including cancer and end-of-life conditions. This education initiative was planned and facilitated by leaders from the American Academy of Pain Medicine (AAPM). AAPM is the leading medical association representing physicians committed to advancing the emerging science and practice of pain medicine. This comprehensive pain medicine curriculum is designed to improve access to quality, evidenced- based multidisciplinary pain care across the healthcare continuum. The AAPM On-Demand Pain Education Portal featuring the CME Essential Tools for Treating the Patient in Pain™ is made possible by educational grants to the American Academy of Pain Medicine Foundation from Depomed, Inc. and Quest Diagnostics Incorporated. Evaluate patients in pain with a focus on anatomy, physiology, psychiatry, and pathology. Discuss the neurophysiology of pain transmission. Assess, appraise, and interpret medically unexplained physical symptoms in order to develop an appropriate treatment plan. Describe pharmacological, interventional, rehabilitation, and advanced techniques for the treatment of chronic pain. Implement evidence-based protocols for appropriate opioid-prescribing practices. Articulate the distinction between drug misuse, dependence, and addiction, and identify the clinical signs of chronic nonmalignant pain. Assess and manage complications in pain medicine related to opioids, NSAIDs, acetyl-para-aminophenol (APAP), and injection-based therapies. Advance the knowledge surrounding the legal issues surrounding pain management. Identify the various screening tools and patient communication techniques available to physicians who encounter high-risk patients. Improve quality of and access to pain care to meet the needs and demands of the escalating pain populations. The American Academy of Pain Medicine designates this enduring material for a maximum of 7 AMA PRA Category 1 Credit(s)™ as noted below. Physicians should claim only the credit commensurate with the extent of their participation in the activity. The material presented in this activity represents the opinion of the authors/faculty and not necessarily the view of the American Academy of Pain Medicine. It is the policy of AAPM to plan and implement educational activities in accordance with ACCME’s Essential Areas and Elements to ensure balance, independence, objectivity, and scientific rigor. As an ACCME accredited provider, AAPM is eligible to receive commercial support from commercial interests but does not receive guidance, either nuanced or direct, on the content of the activity or on who should deliver the content. All program faculty and planners are required to disclose all financial relationships they may have or have had within the last 12 months with commercial interests whose products or services are related to the subject matter of the presentation. Any real or apparent conflicts of interest will be resolved prior to the presentation. All confirmed faculty disclosure information will be made available to participants prior to the activity. Faculty will also be expected to disclose this information to the audience both verbally and in print (slide presentation) at the beginning of each presentation. Faculty members are also required to inform program participants if any unlabeled uses of products regulated by the U.S. Food and Drug Administration will be discussed. The AAPM On-Demand Pain Education Portal featuring the CME Essential Tools for Treating the Patient in Pain™ was made possible by educational grants to the American Academy of Pain Medicine Foundation from Depomed, Inc. and Quest Diagnostics. Presented by the American Academy of Pain Medicine. The American Academy of Pain Medicine designates this enduring material for a maximum of 2.25 AMA PRA Category 1 Credit(s)™ as noted below. Physicians should claim only the credit commensurate with the extent of their participation in the activity.